In 2011, Los Angeles Unified School District (LAUSD) adopted a policy mandating that every middle school and high school in the district must daily pull a group of students out of class to undergo a humiliating procedure: a "random" search of their person and of their belongings. The students are forced to miss class time, gather their things, and enter the hall or a vacant classroom where school staff will ask them to spread their legs and arms as the adult passes a handheld metal detector wand over their bodies. The adults then rifle through students' backpacks — or dump them on a table — looking for "contraband." Law enforcement officers sometimes observe or carry out this intimidating procedure. The searches are intended to be conducted in a non-biased, "random" manner. Yet students, parents, and teachers all report school staff targeting certain groups, including low-income students and students of color. The policy is intended to uncover weapons, but school staff have broad discretion to take any item that violates a school rule; school supplies such as white-out account for 61 percent of confiscated items. 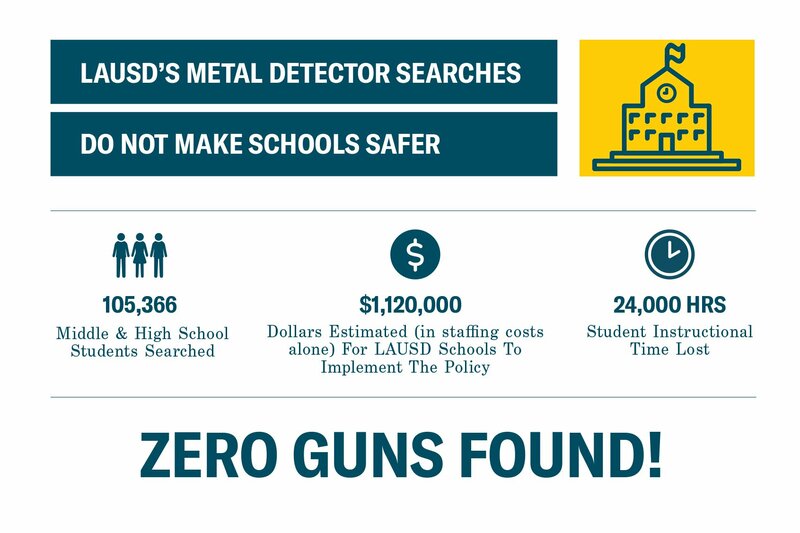 Even if LAUSD's metal detector search policy is implemented with fidelity, the policy would place a heavy burden on students' personal integrity while serving little purpose: LAUSD's data demonstrates that the policy rarely uncovers the weapons it is intended to find — zero guns were found during random metal detector searches — and that the policy does not have any meaningful deterrent effect. "Here to Learn" provides a full analysis of LAUSD's mandatory metal detector search policy. This analysis is based on a comprehensive review of LAUSD metal detection search logs produced in response to a Public Records Act (PRA) request for any entries containing weapons in the 2013-2014 and 2014-2015 school years by researchers at UCLA's Civil Rights Project. The analysis shows that the policy is expensive and ineffective at both finding and deterring weapons at schools. The study also shows that in practice, school staff take advantage of the policy to target particular students for punishment and humiliation. In addition, "Here to Learn" presents the narratives of students and educators. They urge the district to stop criminalizing students and to invest instead in developing healthy school communities. Only approximately 0.08% of 105,366 individual student searches conducted in LAUSD in 2013-14 and 2014-15 revealed a weapon of any sort, none of which were guns. LAUSD's "random" mandatory metal detector searches are not random. Instead, students are targeted based on behavior, location, or personal characteristics. School staff frequently conduct the searches in a far more intrusive manner than the policy intended, with staff continuing to search belongings even when no weapons or metallic objects are present. School supplies account for 61% of confiscated items, including primarily markers, scissors, white-out, and highlighters. Self-care and hygiene items account for 10%, including body spray, over-the-counter pain medication such as Advil and Midol, lotion, cough drops, asthma inhalers, and hand sanitizer. Students consistently report feeling alienated, disrespected, and disempowered by the policy, explaining that the policy devalues their education and makes them feel like criminal suspects. Mandatory metal detector searches force students to miss valuable classroom learning time — 24,000 instructional hours each year — to searches. Mandatory metal detector searches waste staff time that could be spent on more productive activities to enhance student dignity and campus safety and wastes $1.12 million in staffing costs alone, which is particularly troubling in light of LAUSD's ongoing fiscal crisis. 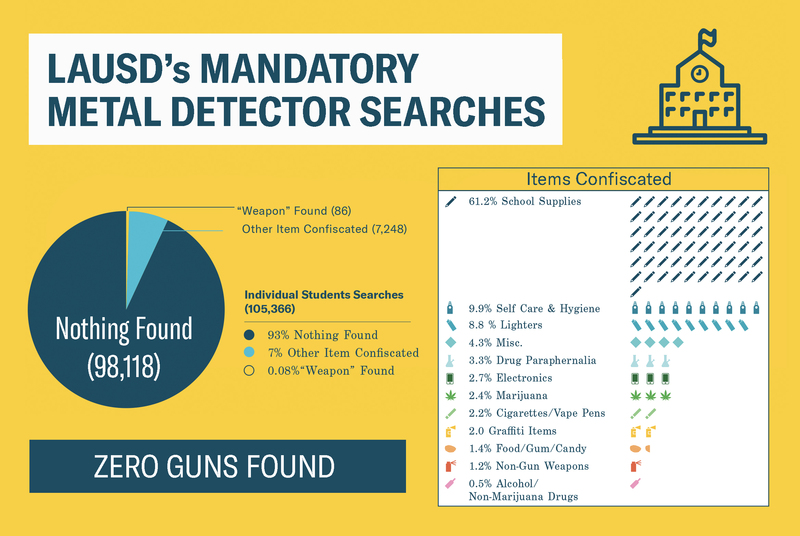 LAUSD's mandatory metal detector search policy is not effective at deterring weapons possession on campus; the number of total weapons have increased since daily random metal-detector wand searches were made mandatory, from 653 incidents districtwide in 2013-14 to 783 incidents in 2014-15. Critically, almost all of these weapons were found by other means and were not discovered by the mandatory metal detector searches. Of the total number of weapons found in LAUSD schools, only 6% were found by mandatory metal detector searches.